For some reason iGetter has stopped working on Mac in Chrome. The iGetter extension is present in Chrome, and enabled, but still no joy. 1. Quit all opened browsers including Chrome. (If you restart your machine turn off "Reopen windows when logging back in" option on the restart alert). 2. In iGetter, turn on both "Integrate with Internet browsers" and "Add Contextual menu support for Internet browsers" options at iGetter preferences, Integration panel. 4. Type "chrome://extensions" (without quotes) in the Chrome's address bar and enable iGetter Extension. 5. Type "chrome://plugins" (without quotes) in the Chrome's address bar and check "Always allowed" options for the two iGetter Plugins . 6. 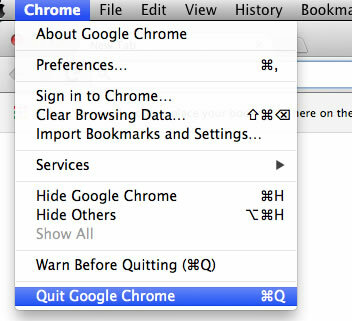 Quit Chrome and start it again. Thanks for the tutorial. The Contextual Menu feature works for me, however I still can't get the 'Automatically start downloading files of types' to work. Any idea what else I can configure? Make sure that you've enabled "iGetter Plugin" in Chrome as shown on second picture above. You can select "Details" top right link and see if "audio/mpeg -> .mp3" is listed for iGetter plugin only. Hi, I am having similar problems with iGetter and Chrome. This has been working fine in the past but recently stopped working. When this was working I could either move the URL to iGetter via rightclick or copy and paste the URL into iGetter. Doesnt work any more. iGetter 293 plug in is enabled in Chrome, as well as Scriptable iGetter plugin. Now I cannot even copy the url and paste it manually in iGetter (not reading cookie?) - I have to start the download, cancel it then copy the download URL (not the same as the original eg from Uploaded.net) and paste that in iGetter. Of course if the download is interrupted it will not resume. Would you please explain what exactly doesn't work. Contextual menu commands doesn't appear or commands doesn't start iGetter, or links appear in iGetter, but you can't download them, or something else. If you want only iGetter contextual menu commands and not click catcher, then turn off "Integrate with Internet browsers" option. Only "Add Contextual menu support for Internet browsers" option should be on, at iGetter preferences, Integration panel. Recent versions of Chrome encrypt browser cookies, so iGetter currently can't read Chrome cookies outside of its integration functions. In other words, only "Download (selection/all) with iGetter" and click catcher can read cookies. For a complete control and a working copy&paste method with cookies, you can try Firefox. You can even disable iGetter plugin in Firefox and then Firefox "Save As" dialog will ask you if you want to download with iGetter or save it with the browser. Most probably you have more than one copies of iGetter installed, so OS X can't find the proper version. To solve the problem, remove all redundant copies and leave only the latest version in your Applications folder.